El Niguel Country Club recently embarked on a master plan for their golf course to enhance player excitement, playability and beauty of the course. To match these recent enhancements, they sought out Malcolm DeMille to create new awards for their Club Championship and Member-Member tournaments. For the Club Championship, Malcolm DeMille brought to life the iconic crown logo in a textured rustic finish. This bronze piece is set atop a three tier base that displays all past champions. Designed with a removable top tier it allows for an easy presentation of the trophy to the Champion. The Club Champion is also awarded a sculptural sterling silver money clip detailed with the club’s crown, wreath and name banner. For their Member-Member tournament the El Niguel Country Club went for a modern look. The Perpetual Trophy has a handled stainless steel tray that highlights the gold-plated 2D version of their crown logo. It is set on a marble and wood base with plenty of room to engrave past, present and future champions. El Niguel Country Club was able to create an array of items utilizing Malcolm DeMille’s Custom Club. The Custom Club provides three levels of memberships giving you choices to select the level that best suits your needs. 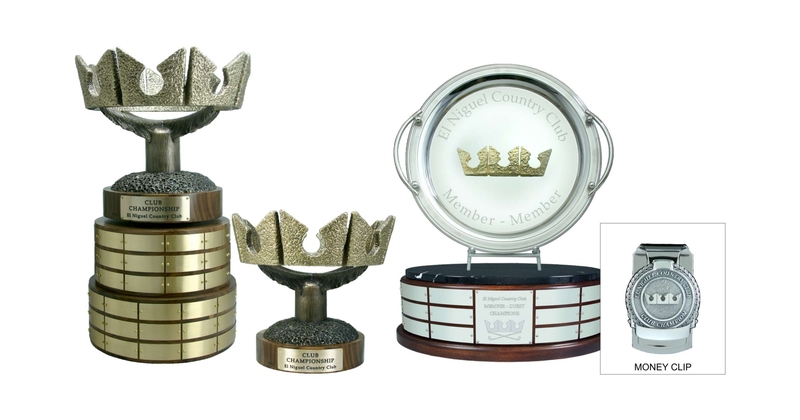 Contact our Sales Team today to see how the Custom Club can enhance your awards and pro shop merchandise.